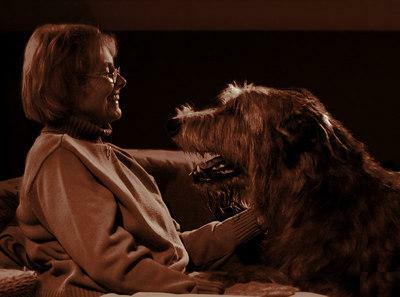 Karen Malone, 1942-2008; Irish wolfhound facts. Front row: Megan, Gandolf, Treavor. Not shown: Seamus, Sweetie, Caitlin (Katie), Sorcha (Sarah). I guess they don't make cameras big enough for seven Irish Wolfhounds? 1. Hey, look at the horse! 2. Hey, where's the saddle!? And here's a more recent one, from 2007. That's Merlin on the right. I was moved to compose an ode for the caption. I'm still the very proud mother. The feeling lingers on and it's very nice. I suppose it's common for dogs of such regal breeds to receive an appropriately highfalutin' name at birth. 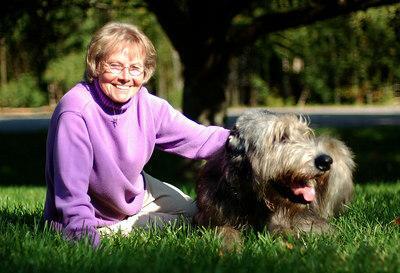 Merlin's was Llenlleawg, and Karen figured it was about time she learned how to pronounce it prior to the Eukanuba National Championship in 2005. Did Karen really like dogs? I mean, really, really, really? Consider this. She'd take in a foster dog with the idea of taking him to an adoption show to find him a permanent home. Then, not only wouldn't she be able to part with him, but she'd fall in love with another dog at the show - and come home with more than she went with! 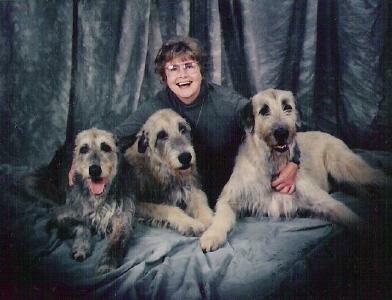 So by mid-2002 she still had six, although only two were Irish Wolfhounds. The four "little" (relatively speaking!) mixed breeds were Beau, Bandit, Chess, and Lyla. After one pet-sitting job for Karen, before all the mixed breeds joined the family, I left a jocular "status report" on the shopping list pad stuck to the refrigerator door. I compiled a list of bits of evidence of suspected canine activity (not on my watch!) observed around Karen's house. Really, though, there's nothing shocking here; we all know that four-legged "children" get away with things the two-legged kind never could! I don't know if Karen ever found a store stocking the first twelve items, but you can see the gusto with which she fulfilled the final one. This shopping list remained on her refrigerator to the end. I saw an opera setting of the tragic, one-act play Riders to the Sea by Irish dramatist J. M. Synge. The Irish dialect intrigued me. The characters used what we would call the reflexive pronoun (himself, herself) in the nominative (the subject). For example, "Herself does be saying prayers half through the night." And, "Maybe yourself and Eamon would make a coffin when the sun rises." And, "Will I be in it as soon as himself?" I mentioned this to Karen and asked if she had heard the like. With a moment's reflection, she realized that Merlin's breeder always called Merlin "himself". Neat! Karen wrote these touching verses upon the death of Sarah. I never knew that she was a poet! It's not the name, it's the dog so named. Let me tell you about my Sarah. A wheaten girl with big brown eyes that were ever so watchful. She guarded the property from things only she could see. "Do not enter, for I am my master's protector." She'd slam up against my leg and say "Hi--PET ME." But I'd pet her because she loved me and I loved her. Knowing that she would be leaving she sent me Ivy. Ivy knew from the beginning she was here to learn. Sarah the teacher said "Watch me." trying to disguise what she was about. When the day came, Sarah said, "Can you follow in my footsteps?" Ivy said "Yes, I can, you've taught me well." Sarah will always be near. for my BEAUTIFUL Sarah is my protector. Sarah, we will meet again in a better place. Please wait for me at the rainbow bridge. Then Katie said "Hey! What about me? I'm Sarah's sister, do you see me? I may not be as physically pretty but I love you as dearly. My kisses flow freely, and are very wet. I see your sorrow and try to comfort you. I too miss Sarah, she was my friend. Maybe it's time for she and I to meet again. So I'll follow in her footsteps. wait for you at the Rainbow bridge." You'll hear more about this wonderful Rainbow Bridge in Appendix 2 below. I had forgotten about the special relationship between Karen and Sarah. So it made it more special to realize that I have pictures of myself with Sarah - maybe the only photos of me with any of Karen's dogs. The photos only exist because of a fluke. I went with Karen to a dog show in the Washington D.C. area in February 1992, and a news crew from Channel 45 was there. I called my brother, Steven, to alert him to the slim possibility that some of us might make the 10:00 news. The feature on the dog show came and went without a sign of us, but as the news was signing off, they ran more footage of the dog show. Lo and behold, Sarah and I appeared briefly on the screen, and Steven managed to get a couple of shots. Here is a very sketchy rundown of what Karen went through between the two photos at the top of the page, and beyond. I cobbled it together from old email exchanges. To be honest, I don't think I was ever too clear on what form of cancer Karen was fighting at the various phases. Let me take a moment to thank everyone responsible for our modern medicine for giving Karen another eleven fulfilling years, or more. And thanks for giving us, all her family and friends, eleven more years of Karen! January 30 1942 - somebody named Karen Stiehm born. Never met her. Summer 1997 - Karen undergoes an operation for ovarian cancer. Her sisters and brother give her a present of a trip to the west coast. August 1998 - Emergency trip to hospital to straighten out Karen's kinked intestines. May 1999 - A day and a half in the hospital for her first chemo treatment. June 1999 - Karen's 2nd chemo treatment. July 1999 - 3rd chemo treatment. July 1999 - A day after her return from chemo treatment, Karen had to have Tiarnan put down. Tiarnan was the senior wolfhound at that time. When I was house-sitting, he wouldn't eat or take his medicine. But he didn't show any signs of being unhappy, and I noted we "spent some quality time together." September 1999 - Last chemo treatment. Apparently, a hurricane scooted through the area during this house-sitting stint. An email records that, to make the 4-mile trip to Karen's house, "I had to turn back on one flooded road, and ease around two fallen trees on the other route." September 2002 - Karen comes through cancer surgery well. I think this is when the leg brace entered her life; at least, she was wearing it by December. January 2004 - "I brought in the New Year in a typical manner for me. I went to bed. I think we should all be celebrating every 'New Day'." January 2004 - Karen undergoes tests for getting into a clinical trial. "It is for a chemo that is typed as an angiogenesis which means that it cuts off the blood supply to cancer cells only which causes them to die. Keep me in your prayers." August 2004 - Subject: Good News!! "I had good news on Friday and yesterday. The CT scan showed an interval decrease in the size of the tumor and my CA125 dropped from 77 to 25 (the bouncing CA125). Praise the Lord. So far I've had eleven treatments." December 28 2005 - What a nice surprise it was to see Karen show up for my mother's funeral! She came up from Glenn Dale, in Prince George's County, to Hebbville, in Baltimore County, my family's ancestral home. October 2007: "During September I had some Cat Scans (3 months earlier than normal). They were compared with CTs done in June. The comparison showed disease progression. I was informed on October 5 that because of the disease progression I was no longer in the Avastin clinical trial. Thats the bad news. "The good news. I was provided information on a clinical trial sponsored by the National Cancer Institute that I might qualify for. "Dr. Kotz, NCI, told me I could be considered for more than one clinical trial given my history but that would be determined by pathology, history, and radiological reports, and if I meet the trial protocol requirements. So this past week I've been running around gathering information/data or requesting it to be sent to NCI so they can make their determination. "If I don't qualify for any of the NCI trials, Dr. Boice said he would try Doxcil. So I thank God that he has provided more than one road that I can journey. "Please keep me in your prayers, I know God answers them." May 2008 (from answering machine message) - "I'm no longer in the other trial and I'm trying to find another one, soooo . . . just too much." June 2008 - "The Doctor at Franklin Square says I'm a good candidate for the trial and is confident that I will get in it. They're faxing all of my info to the sponsor so it can be reviewed, entered into the computer and randomized. I should know tomorrow afternoon (I'm told) which drug I will be getting. I'm scheduled to start one of the two drugs on the 16th, getting the treatment five days in a row, every 21 days." July 4 2008 - my last answering machine message from Karen. As perky as ever! Karen kept this poem among her keepsakes "in loving memory of Ivy Malone". It's not known who the poet was. Hill and valleys with lush green grass. When a beloved pet dies, the pet goes to this special place. They all play all day with each other. The nose twitches! The ears go up! You take your pet into your arms and embrace. Names not in the main text: Donna Smith, David Smith, Sam R. Ewing (Merlin's breeders). Ralph Vaughn Williams, composer, Riders To The Sea opera. Photography credits: Sweet Memories Photography; maryo.smugmug.com; Steven Sauter. Thanks to Karen's sister PJ for making the poems available.